Two years ago, I picked up a pair of bird prints at a thrift store. They were nice enough, but more importantly, they were only $2 a piece. We had just moved into a new place and I was 9 months pregnant, so nesting was on my mind. These prints would go somewhere on some wall. But little C arrived later that week and I never had a chance to hang the prints. Every time I hauled them out of the closest, they just looked so....tired. This weekend I was feeling all empowered to get on top of the blank white walls in the playroom. I examined the prints again. They were printed on beige paper, offset by a lackluster gray matte and trapped in a boring wood frame with peeling gold paint. How to update them? Bring in a bright color. 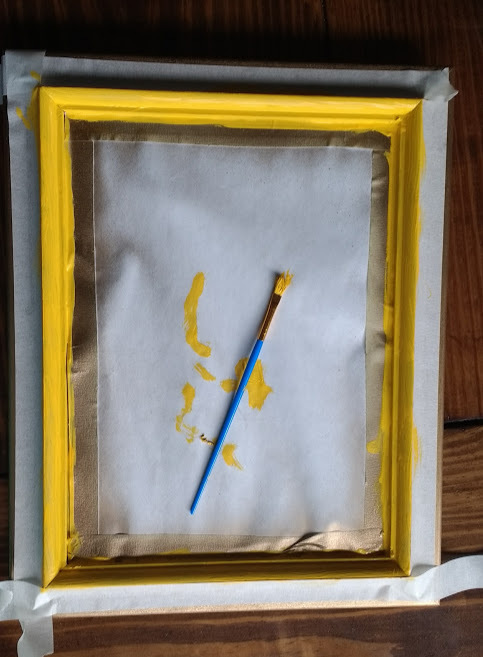 I decided to paint the frame in a softer gold and bright cheery yellow. The backs of the prints were papered over in what looked like original backing. These prints had a history, and I didn't want to mess with it. 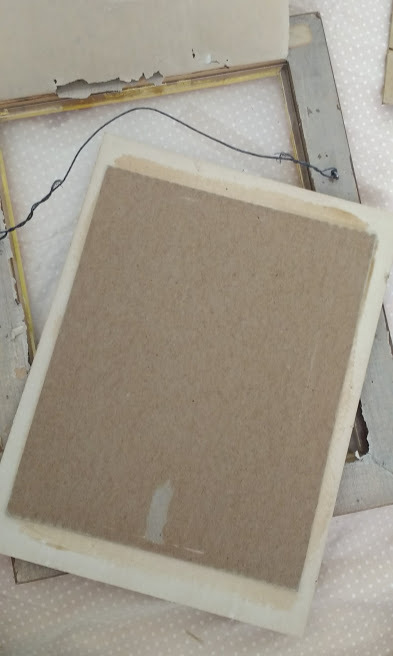 So rather than ripping the backs and removing the glass from the frame, I simply taped over the glass to protect it from the paint. I wanted to protect the integrity of the prints. Moving forward, I sprayed the outer edge of the frame in a softer golden hue. Then I painted a bright cheery yellow accent where there was flaking garish gold. I was about half way through the second one when I stopped for a minute and thought: What have I done? You see, I had this deep down feeling that there was value here. That's why I went to such great lengths to keep the original backing in tact. I mean...it's clearly vintage. Yet here I was, painting willy nilly over the original wooden frame. What if that flaking gold was actually gilding? What if these prints were worth something? What have I done?!? My heart sank. Slowly, I flipped the frame around and examined the backing. No clues here. I grabbed a scissors and began cutting, carefully. Lifting up the delicate paper that tore so easily, I peeled it back and pried up the rusty nails holding the print in place. There was a cardboard insert that had to come out, and then I pulled out the print itself. It was mounted on a board. I examined it and couldn't find any information...no signature, no markings, nothing. So I took a good look at the print again. Plate 28. Meadow Lark. 1. Males; 2. Female. Of course! Duh. Why didn't I realize? It's an Audubon print. Dummy. But wait. Is it valuable? I pulled up my phone and started a Google search. "Original Audubon prints can be worth multiple thousands of dollars." 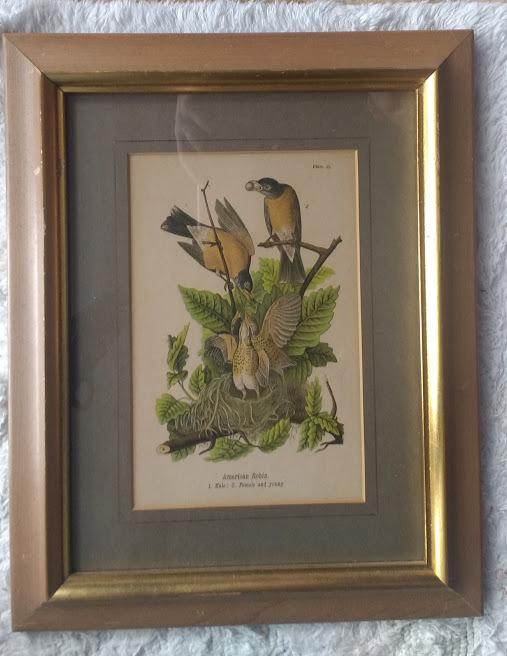 "Man finds box with Audubon prints in grandma's attic, valued at one hundred thousand." Woah. Tell me more! "Ways to authenticate your Audubon print." "If your print measures a standard paper size, it's probably a cheap reproduction." Out comes my tape measurer. I stretch it across the back of the mounting. It's roughly 8"x10". Bummer. But wait, "Original prints may have been trimmed for framing." "Trimmed prints are less in value, but still high." Ooooooooo. Hey! Hey! They obviously had to trim this print to mount and frame it. "Still wondering if your print is an original? Look for specific markings in the corners of the print." No markings....but wait, they trimmed them off! "Original Audubons were printed on white paper." Hmmm. My paper is very beige. But, you know, I left newspaper out in the sun for a few days and it turned yellow. So yeah, sun exposure. Moving on! "Look at your print closely under a magnifying glass. If you see thousands of colored dots, it's a modern reproduction." Shoot. I don't have a magnifying glass. I wonder if I could take photo and then zoom in?? Those kind of look like dots. I can't be sure. My camera isn't that great. "Original prints were colored by hand, except in the case of the extremely rare chromolithographs." Well, then those are definitely dots, and I have a chromolithograph on my hands. "Audubon represented his birds life size." OK, well these are small birds. I mean, how big is a Meadow Lark? Google, help me! "8 inches." Alright, I give in. I'm grasping at straws. So my prints are probably worthless. Probably. I'm still holding out hope that someone down the road will come across this post and look at my pictures and say, "Why! You have a masterpiece on your hands! Let me help you unload it and cash in! It's so valuable, it doesn't even matter that you did a bad paint job over pure gold leaf on the frame. $$$$$$$ down the drain...and you can afford it.